Sugar Theater takes its point of departure in conversations between a poet immersed in the convoluted and complex spaces between words and bodies, and scientists at the Faculty of Health and Medical Sciences occupied with deciphering somatic structures of information and communication related to sugar. Interestingly, it took very little time for the poet and scientists to find a common point of departure for ongoing, interdisciplinary conversations: namely the shared usage of metaphor in the undertaking and explanation of research into core matters of things. Sugar Theater is an exhibition by Morten Søndergaard made in collaboration with Laboratory for Aesthetics and Ecology. The exhibition Sugar Theater is a theatrical fabulation, a fantasmagoric encyclopedia of sugar playing with the many sticky connections between science and art, between bodies and languages, between things and the definitions we deploy in order to make sense of them. The exhibition asks: how, who and what have we become with sugar? Sugar is one of the most fundamental building blocks of nature. Organic material is composed largely by sucrose, glucose and starch: sunlight and water transformed by photosynthesis into sugary substances for the compositions of life on this planet. Concurrently, sugar is also a dominant – and potentially dangerous – part of our everyday: of our landscapes, our histories, health and diets. As a crop heavily tainted by the horrors of colonial history, sugar has played a huge part in defining national borders, ecologies, global economies, cultural barriers and artistic practices – even some of the most influential European art institutions are founded upon money made from sugar production. From an evolutionary perspective, we might say that sweetness has conquered us; that nature’s own means of saccharine seduction has persuaded us into spreading, cultivating and securing sweetness to a potentially harmful degree – for the health of humans and biospheres alike. Sugar tells the tales of culinary changes and experiments throughout history, it tells tales of the opulent beauty at the dessert tables of the aristocracy, and it tells the tales of the poor, malnourished working classes both of today and of early industrialization finding comfort and much- needed energy in various sugary treats. Sugar tells tales of introducing children to capitalism by means of candy, of how sugar and commerce share inextricably conjoined histories. And it tells tales of poetry, passion and pop thoroughly infused by metaphors of sweetness. Sugar Theater runs in four acts, each tracing sugary threads in and out of bodies, materials, voices, scientific and artistic disciplines. Here, sugar is both a material of reality and a metaphor, splitting, conjoining, mirroring and preserving a number of stories in the crystalline prisms of the theater. changes in the news – whether it is good, bad, happy or sad. The trees are a reflection of the world they are grown in, and consist solely of adjectives from the news articles, as the sugars can be described as that which specify and sophisticate inner processes – i.e. as adjectives of the body. This work gives form to two key ideas often discussed in the corridors of the Faculty of Health and Medical Sciences: a) That sugars are the third language of life – with a vocabulary, grammar and use quite unique from DNA and proteins, and b) That sugars are found between the cell and its environment, and their language allows for a richness of expression, making them ideal communicators with the environment and its neighbours. Inspired by the idea of the metabolism as a signalling system within the body, the sugar cloud displays the tissue and inner workings of a poem. 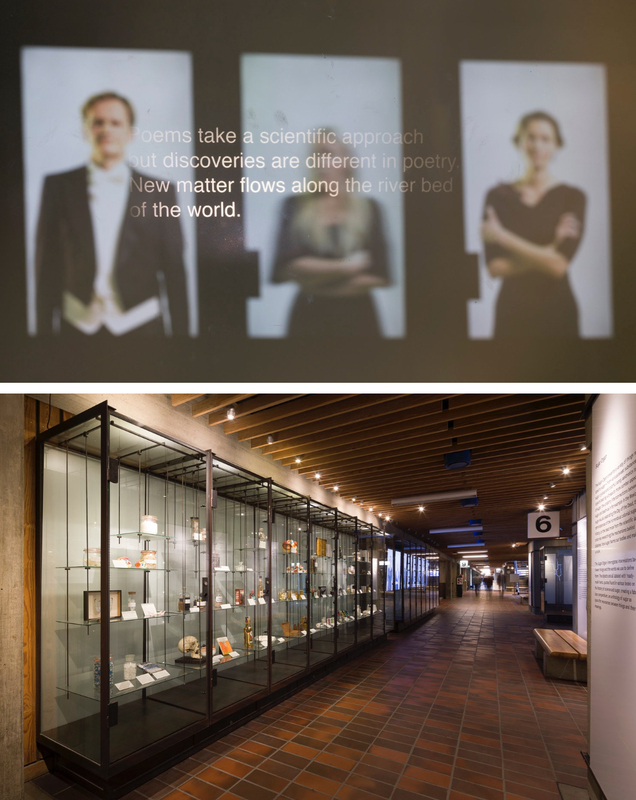 The poem Contact by Morten Søndergaard, the core text and poetic statement of the exhibition, is projected from within a cloud finding its own form, an image of the ultimate secret and mystery of life to poets and scientists alike. 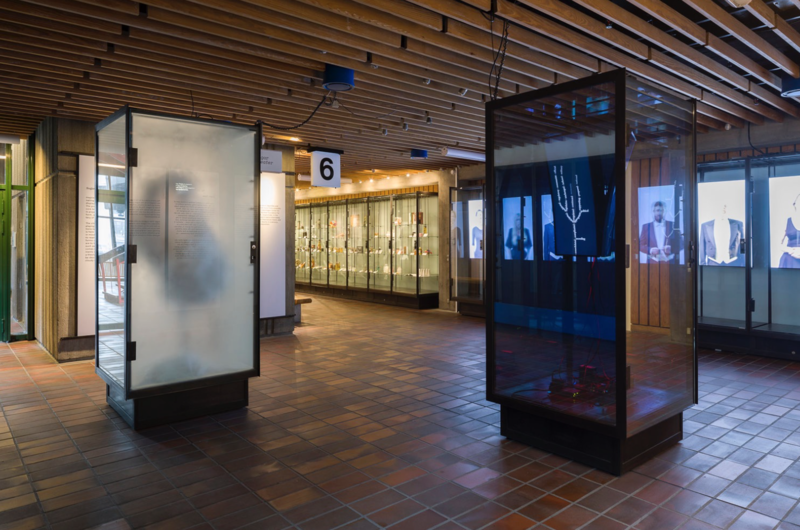 The vitrine acts as an incubator for meaning, playing with the various metaphorical connections between information and clouds. The sugar encyclopedia informs us that the pairing of clouds and crystals are to be found on a variety of levels in nature such as in ice-crystals inside clouds. Sugar often comes in the form of crystals, in orderly arrangements of sucrose molecules. Perhaps a thought, a theory, a scientific proposition or a poem can be described as a pendular movement between cloudy sentiments and manifest crystallizations. The Sugar Organ presents a variety of things related to sugar – from various sweet substances, sugar crystals and colorful candy aesthetics to objects bearing witness to more somber aspects of sugar: the uncanny interconnections between sugar and death as in for example in the Mexican sugar skulls celebrating the Day of the Dead, the reminiscences of the horrendous colonial sugar history, or the dead mice from the scientific laboratories researching the mechanisms behind diabetes: how sugar harms our bodies and makes us sick. 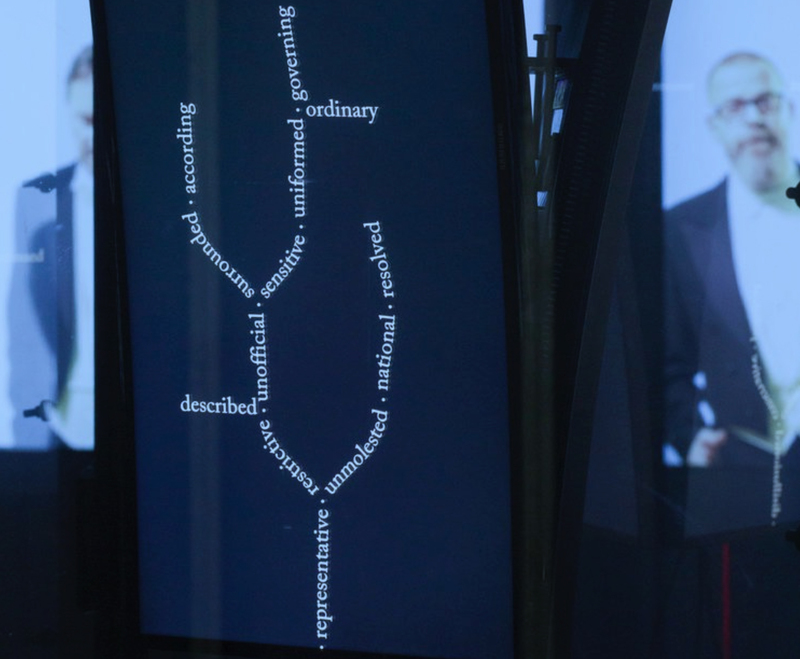 Sugar Organ interrogates interrelations between things and the words we use to define them. 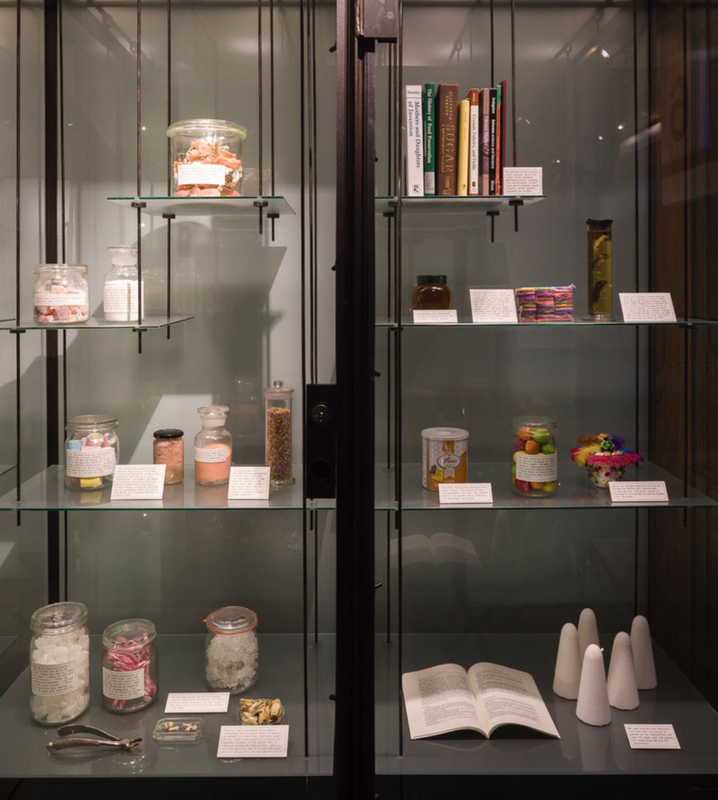 The objects are all labeled with ‘readymade’ texts, quotes found in various books on the history of science and sugar, creating a fabulous compendium, an anthology of sugar as space for resonances between things and their meanings. The Sugar Choir makes science digestible and delicious, composing sweet music from scientific research texts from The Copenhagen Center for Glycomics and the Novo Nordisk Foundation for Basic Metabolic Research, respectively. 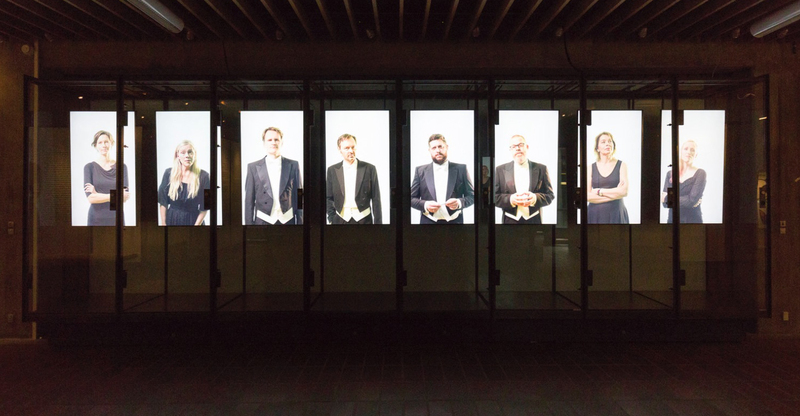 In Sugar Choir , the two research teams alternately compete in order to make themselves heard, and harmonize their research results in a sensory, strange and seductive composition.